Walking around builds up a good appetite. After the pizza lunch we walked and shopped, and eventually made our way to Cafe Habana, which was recommended to me first by my bf's sister, a fellow foodie, then by my dear friend who pigged out with me in Europe for 2 weeks straight last summer. There are two separate Cafe Habana shops side by side. One is a sit down and order kind of place which happened to be packed when we walked in at 3pm, so we went next door where you can order for take out. The corn is amazing... and for $1.95, really hard to beat in price. The corn I had at the North Carolina State Fair was more than double the price, and had butter on it. Anyway, back to the point: the corn is amazing. The seasoning is delicious. They give you a slice of lime to sprinkle on top as well, and there is melted cheese on top. I think it would have been even better if it was warm, but the taste was just right! 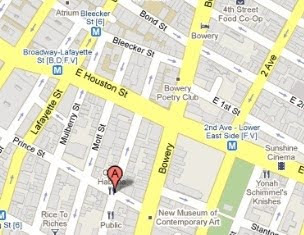 There is also a Cafe Habana in Brooklyn: map here.